'We at this table pledge our allegiance to the Dalek cause. Our armies will reduce the galaxies to ashes, their people to dust. And Earth we will conquer first!' In their quest to gain control of the Solar System, the Daleks have taken possession of the Time Destructor, a weapon which threatens the safety of all who stand in their way. As they head up an alliance of alien races bent on destroying the human race, in their midst is none other than the treacherous Guardian of the Solar System, Mavic Chen. 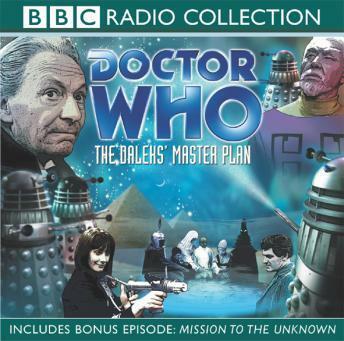 A dangerous chase ensues across volcanoes, jungles, deserts and futuristic cities, as the Doctor and his companions struggle to prevent the Daleks' plans coming to fruition. The stakes are high, and for the first time in the programme's history the lives of two TARDIS travellers are lost... Peter Purves (who played Steven in the story) narrates these thirteen episodes, only two of which survive in the television archives. Included is the special 'teaser' Mission to the Unknown, which was transmitted some weeks before the master plan itself was unleashed. This story marks the first appearance, here playing space agent Bret Vyon, of Nicholas Courtney who would later create the recurring role of Brigadier Lethbridge-Stewart. Jean Marsh and Adrienne Hill also star as companions Sara Kingdom and Katarina.